Kat's Food Adventures: Johnny Rockets Movie and a Meal Deal! 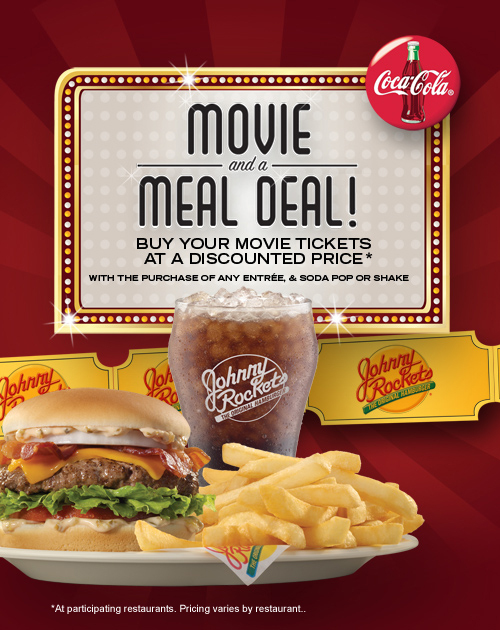 All of the Johnny Rockets locations listed below participate in their discounted movie tickets program with various movie theaters including AMC, Regal and many more. Visit a participating location listed below to purchase a discounted movie ticket. One discounted movie ticket available per meal purchase. Meal includes entrée, soda pop or shake. Valid while supplies last. Not valid with other discounts or offers. No cash value. Discounted movie ticket is subject to the terms and conditions printed on the back of the ticket. Only available at participating theaters. *Movie ticket pricing varies. For more information contact your local restaurant. Click here for the official Johnny Rockets Info Page.